The problem in measuring your IPD is that IPD depends on eye convergence; as your eyes rotate inwards to foveate on close-by objects, IPD decreases because the eyeballs rotate around their center points. Meaning, if you hold a ruler up to your eyes and try to focus on it, you’re going to measure your near-converged IPD, not the infinity-converged IPD (which is what you want). But there is a very simple and elegant solution; it only requires a mirror and a ruler. Check out Figure 1 below. If you look at your reflection in a mirror, and, say, focus on your left eye, then your left eye is going to look straight out. If you then focus on your right eye, now your right eye is going to look straight out, meaning the left- and right-eye viewing directions in steps 1 and 2 are parallel, as if you had foveated on an object at infinity. 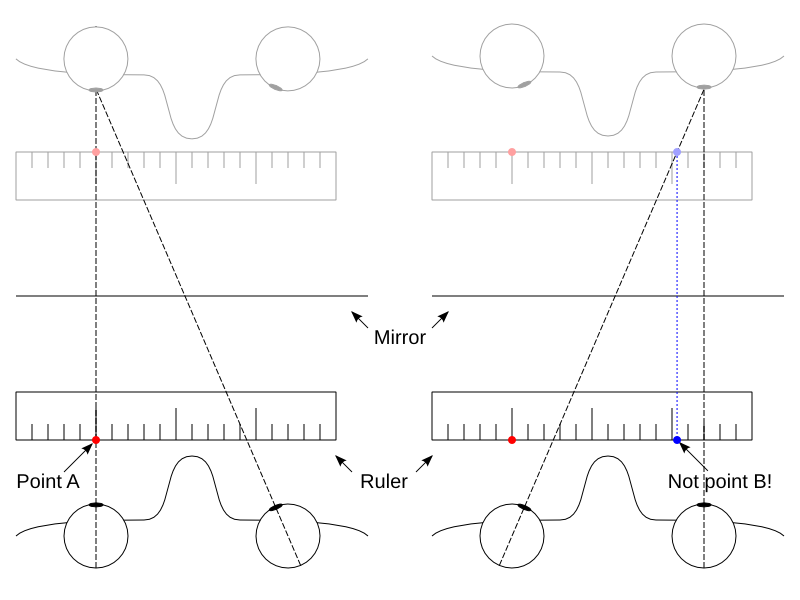 So here’s the procedure: Look at your own face in a mirror, and hold up a ruler such that it’s right underneath both your pupils, and hold the ruler parallel to the mirror (that’s important!). Now focus both eyes on your left eye’s reflection, and move the ruler such that the “0” marker, as seen in the mirror, is directly underneath the center of your left pupil. Then hold the ruler very still, and focus both eyes on your right eye’s reflection. Whatever tick mark shows up underneath the center of your right pupil is your precise infinity-converged inter-pupillary distance (and also the distance between your eyeballs’ centers). Voila! 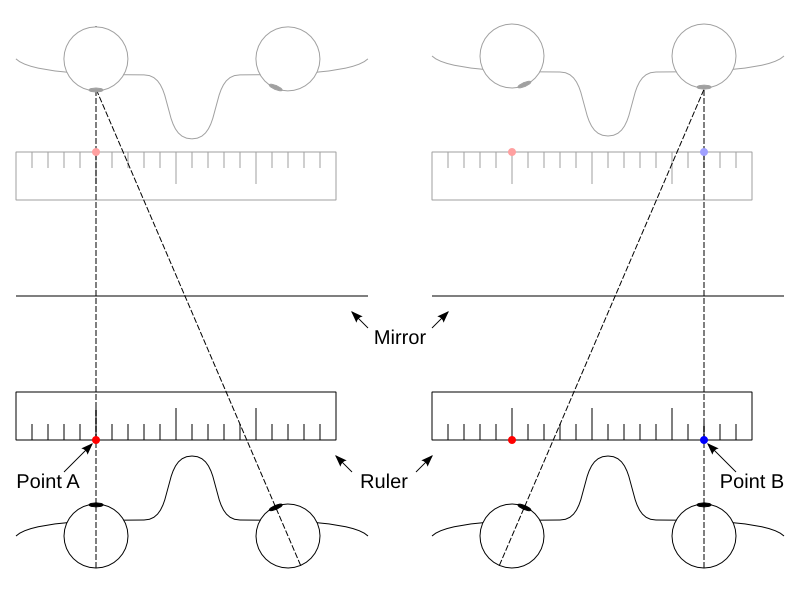 In theory you can hold the ruler anywhere between your eyes and the mirror, but the closer it is to your eyes, the easier it is to read the tick marks when focused on your eyes’ reflections. Figure 2: Eye dominance problem when measuring IPD. In this example, the viewer is left-eye dominant, and marks down a wrong position for point B due to the parallax induced by the ruler being some distance in front of the eyes. Solution: close the “off” eye when marking down points A and B. In the first step, Alice correctly moves the ruler so that the zero tick mark coincides with point A, but in the second step, notice how she marks down the wrong point B, because she places it where her dominant left eye sees her right-eye pupil behind the ruler, instead of where her right eye sees it. The ruler being held some distance in front of her eyes causes a parallax shift, and leads her to underestimate her IPD. The solution is quite simple: when focusing with the left and right eyes in steps 1 and 2, respectively, just close the “off” eye, i.e., the right eye in step 1 and the left eye in step 2, to avoid dominance issues. Just be careful not to move the ruler while opening one eye and closing the other. I recommend holding the ruler against your nose to keep it securely in place. This entry was posted in How-To and tagged Calibration, HMD, Inter-pupillary Distance, IPD, Oculus Rift by okreylos. Bookmark the permalink. I used my digital caliper for doing this measurement, and it worked well. I held the body member of the caliper firmly against my nose, got the fixed end of the caliper aligned with one eye (other eye closed), then, keeping the caliper fixed where it was against my nose, moved the thumbwheel to open the caliper, stopping when the moving blade aligned with the other pupil (original eye closed for this observation). Seems to have worked well: 63.1mm. Thank you for this guide! I was only off by about 2.7mm but it’s nice to know I have it dialed in. Now when guests come over I can have them measure in the mirror before setting them up. My previous method involved measuring eye strain in the HMD while looking far to the side and was not something I would suggest. You can try “Eye Measure” if you have an iPhone X. Does near and far PD and it’s pretty accurate. Uses FaceID tech. except the distance changes depending on the rulers distance from the mirror.. so if I am standing 1ft away and take a measurement, it will not be the same as if I am 18″ away. Yeah, but you have to sit through four minutes of advertising for some Daydream headset before he gets to showing the web app, and the link in the video description first goes to a web survey for me. So here’s the direct link to the web app, bypassing the video and survey: http://www.trylive.com/demo/trylive-eyewear/pupil-distance. Now, if anyone wants to go that route, for the love of all that is holy, don’t show your credit card or bank card to a random online app that uses your webcam.